For the last three decades, Bridge Team Management (BTM) has been a process sitting at the periphery of a seafarers skill set, and had been seen as a "nice-to-have" skill, rather than a mandatory requirement. The situation has changed with the Introduction of the STCW2010 Manila amendments (2), which now requires that all bridge officers, during their studies for a Certificate of Competency, undertake Bridge Resource Management training. This project studies seafarer’s perceptions of BTM, how it has been implemented on board their vessels, and will look at how these perceptions change with the introduction of the Manila amendments. 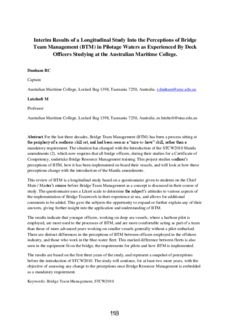 This review of BTM is a longitudinal study based on a questionnaire given to students on the Chief Mate / Master’s course before Bridge Team Management as a concept is discussed in their course of study. The questionnaire uses a Likert scale to determine the subject’s attitudes to various aspects of the implementation of Bridge Teamwork in their experience at sea, and allows for additional comments to be added. This gave the subjects the opportunity to expand or further explain any of their answers, giving further insight into the application and understanding of BTM. The results indicate that younger officers, working on deep sea vessels, where a harbour pilot is employed, are more used to the processes of BTM, and are more comfortable acting as part of a team than those of more advanced years working on smaller vessels generally without a pilot embarked. There are distinct differences in the perceptions of BTM between officers employed in the offshore industry, and those who work in the blue-water fleet. This marked difference between fleets is also seen in the equipment fit on the bridge, the requirements for pilots and how BTM is implemented. The results are based on the first three years of the study, and represent a snapshot of perceptions before the introduction of STCW2010. The study will continue, for at least two more years, with the objective of assessing any change to the perceptions once Bridge Resource Management is embedded as a mandatory requirement.